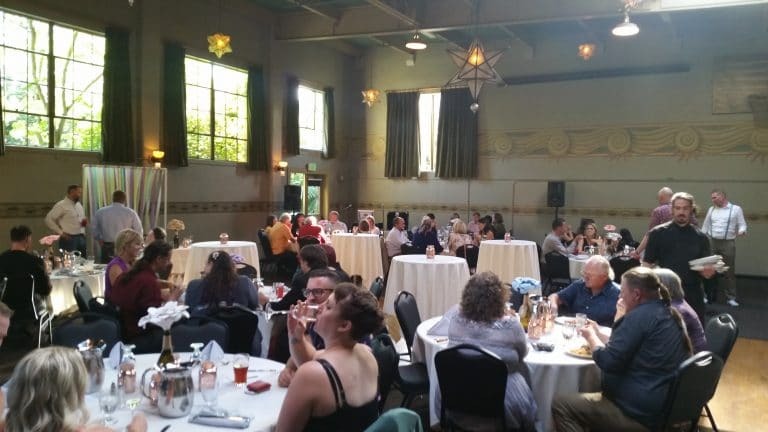 Andrea and Marshall’s karaoke wedding was held Friday, August 24, 2018 at McMenamins Kennedy School in Portland, Oregon. The reception was in the Gym with the ceremony outside in the adjacent courtyard. 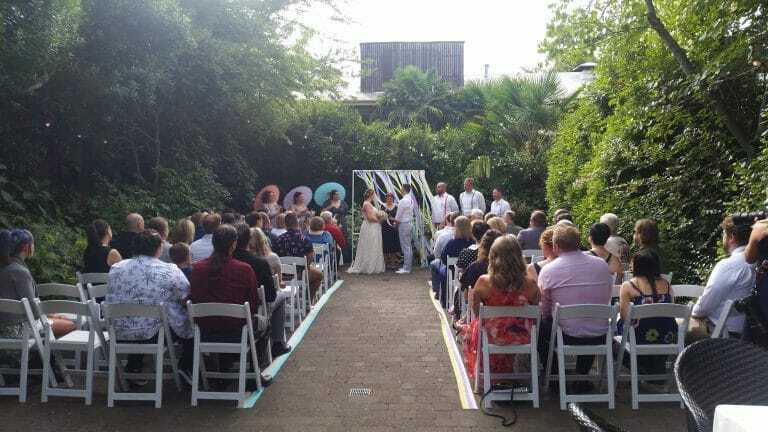 I setup my sound system in the corner so I could provide music and sound for both, including a microphone on a stand for two readings and a lapel microphone for the officiant. Following the ceremony, everyone made their way inside for drinks and refreshments as the newlyweds posed for additional photos. 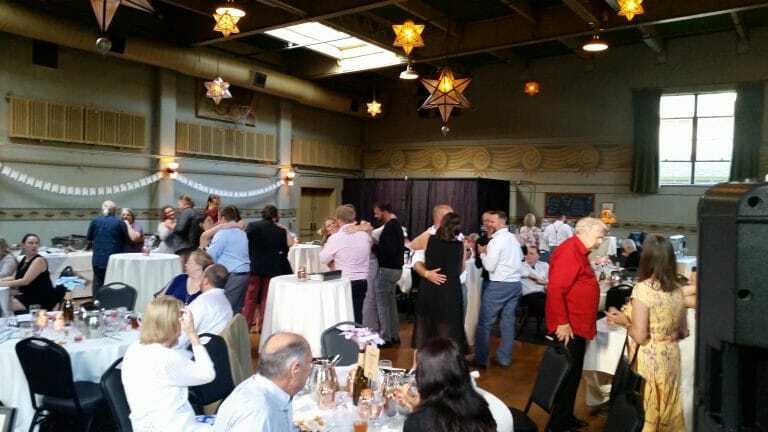 Background music was a mix of Rock and R&B selections as requested by the bride and groom, including artists such as Stevie Wonder, Beach Boys, Childish Gambino, Alabama Shakes and more. After the cake cutting, Andrea opened the karaoke by singing “I’ll Stand By You” (Pretenders). She was then joined by her father to perform “Proud Mary” (CCR). As expected, and maybe because it was still early (7pm), we didn’t have many ready to keep the karaoke going, but that would certainly change later on. 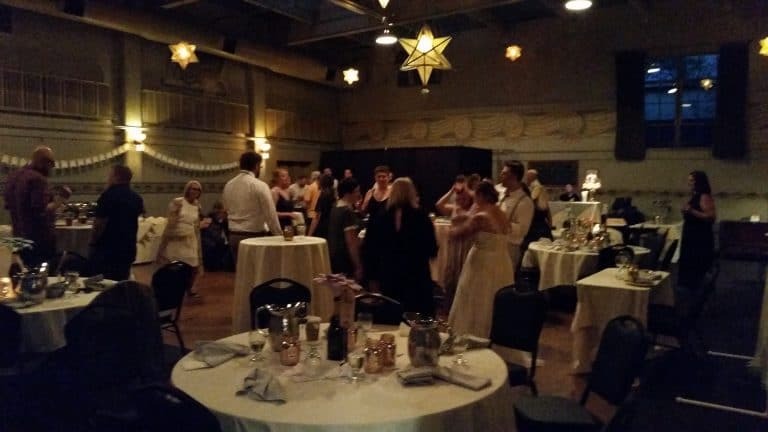 I opened the dance floor with a slow song and then played a variety of hits, including “Hey Ya”, “Ain’t Too Proud To Beg”, “Jailhouse Rock” and more. The karaoke picked up about an hour later as guests signed up to sing everything from “Keeping The Faith” and “Careless Whisper” to “Super Bass” and “I Want It That Way”. Then came a heavy set of 90’s hip hop for the dance floor pulled from the newlywed’s request list… “California Love”, “Hypnotize”, “No Diggity”, “Humpty Dance” and more. We finished the night with more karaoke performances, including Andrea singing the finale, “Dream A Little Dream of Me” (Mama Cass). Congratulations Andrea and Marshall and thank you for choosing PRO DJs.